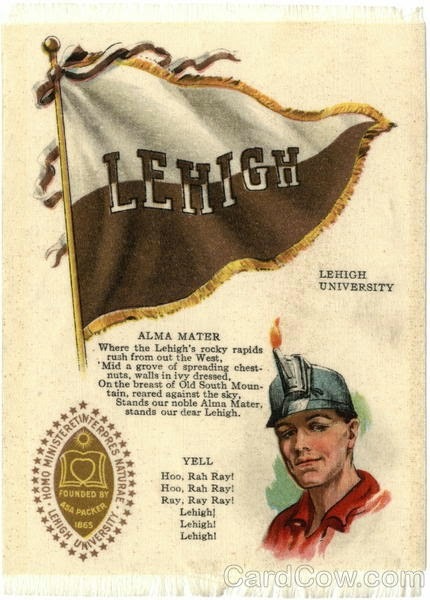 Before the big games versus Lehigh, the Lafayette students, organized by Davis, would meet on the grounds of their college to pass out pamphlets with the words to the latest cheers in order to rehearse them for the following day’s game. By 1897, Lehigh would be doing the same. Originally referred as "mass meetings", eventually these would evolve into something called “smokers”. They were very popular at the time for any gathering of men, it seemed, and celebrated everything from fraternity gatherings to meetings of the civil engineering club to Thanksgiving. At Lafayette, these involved specialized songs, written by coaches and athletics representatives, that were “rehearsed” then unleashed at football games, especially against their neighbors to the west. At Lehigh they would do much of the same, but they would also include athletics "stunts", wrestling and boxing matches were on offer as well between students, with the students all the while enjoying their free tobacco. As smokers evolved, basketball games were also played versus the sophomores and juniors, helping develop the Brown and White’s first basketball teams. 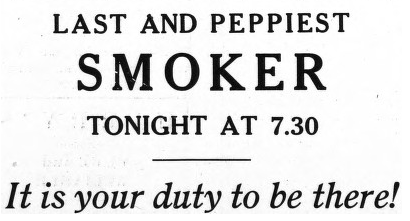 The idea of “smoker” pep rallies as linked to the Rivalry seem to have morphed over time. At Lehigh “smokers” took place in the gymnasium, but didn’t have anything to do with football, at first. They did involve free tobacco and pipes for all present, but instead involved wrestling and boxing matches only. The first documented Lehigh “smoker” of this sort predated Lafayette’s football-specific ones. It would be 1898 when Lafayette would institute a smoker for the expressed purpose of raising spirit for the games against Lehigh. By 1902, smokers involving football and other sports were becoming the norm. Part of the spirit-raising involved singing the class songs, where each class would be given a different part to sing. Only during the smoker did the classes know how all the pieces would fit together for the Lafayette game. Tobacco companies were frequent advertisers in The Brown and White, and also had a cozy relationship with college football. With their product, companies included inserts of popular colleges and their theme songs as "silks". As Lehigh’s football teams struggled in the late 1920s, the smokers were critical in keeping up spirit as the students enthusiasm waned in general about the Brown and White sports teams. Freshman head coach (and future head football coach) Austin Tate didn’t mince words, either. “The keynote to Lehigh sports should be optimism,” he said. “There is too cynical an atmosphere among the students; wisecracking individuals go around doing anything but trying to support the teams,” a statement that couldn’t have inspired much “pep” from the students in attendance. Smokers served as a way to unite the students and alumni and to educate them as to the role of athletics in the school and among the alumni and to celebrate the careers of some of the more important pioneers of the athletic department. One smoker in particular meant a great deal to one of Lehigh’s faculty, Howard R. “Bosey” Reiter. Reiter was a football pioneer who, as an undergraduate, was a star halfback at Princeton. As head coach at Wesleyan, developed the “overhead spiral pass” that is well-known today by anyone who has ever thrown a football. In 1910 he coached Lehigh’s football team, and, in 1911, accepted president Henry Drinker’s proposal to become the first professor of physical education on the campus. In this capacity, he can be considered Lehigh’s first athletic director. Shortly after Bosey’s hire, he would hire his successor as football coach in 1921, “Tom” Keady from Dartmouth, where over his eight year coaching career at Lehigh he would guide the Brown and White to national relevance by being Lafayette’s equal. Every season in Keady’s coaching tenure, Lehigh boasted a winning record. Wrestling became a varsity sport at Lehigh during Bosey’s time, so he also hired wrestling’s first full-time head coach, Billy Sheridan. Sheridan would remain at Lehigh for 42 years and guide the Engineers to be an EIWA and national power, winning many championships and arranging for Bethlehem to host the NCAAs as well. Lacrosse, too, saw Bosey’s mark as they hired their first-ever full time head coaches. During his time, they would win five national championships. Bosey was also critical in building up spirit in the Rivalry among both the undergraduates and alumni by setting up the programs for these smokers, lining up football coaches and stars like Walter Okeson and many more. He was a frequent speechmaker in these spirit-building meetings, and also got Sheridan and the nascent wrestling program involved as well. Sheridan featured prominently in the smokers of Bosey's time, even early in his career wrestling himself. Bosey would work tirelessly with not only the students and alumni, but also the members of the Bethlehem community as well. He set up the first “Lehigh Booster Club” consisting of both children and adults, and helped start an ingenious program to involve young underprivileged kids in the neighborhood called the "Sand Hogs Brigade". Rather than have the kids sneak into the games (by burrowing under the fences, hence their name), he gave them a set of rules to follow (for example, keeping their hands washed and clean), and giving them their own section in Taylor Stadium. His actions ensured that Lehigh would have a large influence in Bethlehem in terms of attracting future students, including athletes. He was so beloved that, at one smoker in 1923, “Bosey” was presented with a Ford car - presented as a gift from his grateful students, who saw him ride his old beat-up bicycle to work every day and wanted to surprise him. Ultimately, smokers would go from being general pep rallies and celebrations, organized whenever the mood hit, to becoming very closely associated with the Rivalry - the union of the football season and the wrestling season. Eventually these "smokers" would start to change in the 1930s and 1940s into different sorts of pep rallies, less associated with tobacco and more associated with athletics - and mischief.